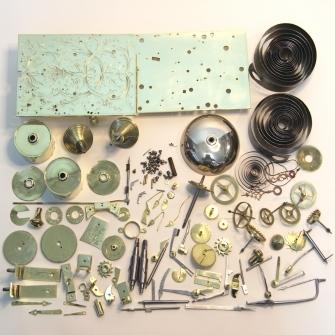 "I bought a Vulliamy bracket clock from Bournemouth Clocks a few weeks ago and they set about restoring it. The clock arrived yesterday and it is everything they promised and more. The restoration was sympathetic and non-invasive, although they dismantled the whole thing they have not destroyed the patina so although the movement looks like new one can still feel the age. I cannot speak too highly of this Company, particularly Sally. Communication is beyond reproach, she sent me photos and videos of the restoration and a USB with the clock of the whole process and answered every email within minutes. This didn't stop when the clock was bought and paid for and she was genuinely concerned with the packing and transport to make sure it got here safely. 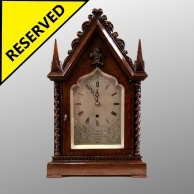 I'd have every confidence in buying another clock from them, OK it will cost more than you might pay at Auction but, and it's a big but, they vet the clock, restore it superbly and supply a Certificate of Authentication." As a dealer in fine antique clocks, I used to shy away from buying clocks that had been converted from Verge to Anchor escapement because I simply could not find a restorer capable of reinstating the escapement without fuss and with high enough skill. 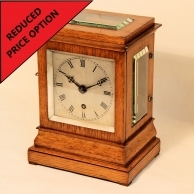 Fortunately I no longer have this problem, the Clockshop carry out all such work for me to the highest standard possible - returning lost value to my stock and making it desirable once more. I will send pics of the bracket clock in due course. 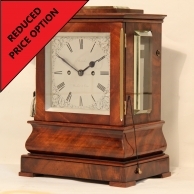 I have heard fellow customers bemoaning the cost of restorations, repair & servicing of antique and elderley clocks. This is unsurprising bearing in mind the current financial climate however, I feel it is time to speak up for the poor old Clockmakers. Am I qualified to do this? I think so, having collected clocks for 35 years and done my best to restore and maintain them myself. So, let's use an example. I was recently given an old ship's bulkhead clock. It was black, rusted solid and would need a labour of love to restore! Mark Taylor's estimate for restoration was around £500 but I was determined to do it myself. So, I stripped it. polished the case which turned out to be silver and started on the movement which was corroded and rusted solid. It had a broken arbor, damaged teeth and was very worn. Some 60 hours later it was back to its former glory. Let's put this in perspective. As an amateur, my time was worth approximately £8.50 per hour (£500 devided by 60 hours). If Mark had done it in half of the time it would still only have been £17.50 per hour and he has to maintain a business premises and equipment. A franchised garage charges between £95 and £105 per hour, with additional costs for parts (that are on the shelf). If they are unobtainable then the car is irrepairable. A plumber or electrician will charge £30 to £50 call out fee plus the same per hour for labour and extra for parts. In conclusion, the next time that you are tempted to bemoan the costs of Professional Clockmakers, just think what you are getting for your money; an appreciating asset and a thing of beauty. Mr. Taylor restored our carriage clock that had not only been neglected but messed up by another local repairer who should not have taken on the work. He did a wonderful job and we were astounded at how beautiful it looked. It developed a striking problem after about six months which was corrected perfectly under guarantee. We were welcomed back and assured that the fault would be corrected. We would not hesitate to reccommend Mr. Taylor as we did not believe the work he carries out was possible. 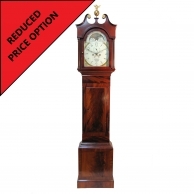 As a pensioner, I was worried that I would not be able to afford my late parents mantel clock to be repaired at the clockshop because all their clocks seemed much grander than mine. I eventually plucked up the courage to ask them for a quote and though it was expensive it wasn't as much as I had thought it would be. When it was eventually ready I collected it and must say it has never worked so well. I always thought old clocks to be temperamental until Mr. Taylor told me that they are not if they are in good condition. I cannot convey the pleasure I am now getting from my old family mantel clock. Skill like this just does not exist these days, no wonder they can't get an apprentice or anyone to train. Astounding sums up the clockshop in my opinion. Thanks for your continued good work Mark. Really pleased with the work, took three times longer than they said it would but obviously had problems however, didn't charge a penny more than the quote and though they aren't cheap - they're good. Many thanks. Paul Jason, Robin Hood Cottage, Cragg Road, Yorkshire. 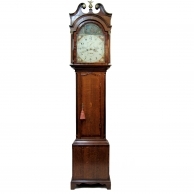 Humbly considering myself to be a serious collector of extremely fine and rare antique clocks I have encountered many clockmakers and restorers of varying standards over the past thirty years. Some of these craftsmen have been highly qualified or recommended by 'Authorities' in the field of Horology. That being said, I have come to realise that in my opinion (for what it is worth), work carried out at this little clock shop in Bournemouth is amongst the finest and highest quality in the world. I have had work undertaken by Mr. Taylor that has been nothing short of a masterpiece. If you want the best then you go to the best. (name withheld at request). Don't understand how they can charge so much for clock repairs or how they can justify the time it takes. Clock collected and paid for and is the best it has ever been. Couldn't find anyone else so had no choice! Who is Mr. Taylor? Quite simply - a genius! Darrel Jones, colleague and friend (Sadly no longer with us and greatly missed).